Afan Forest Park at Afan Forest Park (NRW)0300 065 3000work Forest or WoodlandThe Afan Valley is rich in history. From early monastic estates, the landscape developed into a farming area and later a coal mining valley. The last mine closed in 1970 and the area was designated as a forest parkin 1972 because of its great walking potential. The last mine closed in 1970 and the area was designated as a forest park in 1972 because of its great walking potential. Nowadays waymarked trails criss-cross the valleys and hillsides through the forest, passing be abandoned mines, former tramways and disused railways. 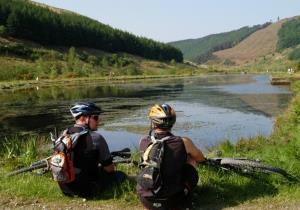 You can explore Afan Forest Park by following forest tracks and roads on foot or by bicycle. natural Resources Wales manages a number of waymarked walking trails which start from Afan Forest Park Visitor Centre and from the car park at Rhyslyn. Afan Forest Park is the fastest-growing mountain bike area in Britain. Natural Resources Wales manages a range of mountain bike trails that are suitable for everyone from beginners to expert mountain riders. There is a network of bridleways in Afan Forest Park, some of which you need a permit to access. Please contact us to find out more about horse riding in Afan Forest Park or to apply for a permit. The Afan Valley is rich in history. From early monastic estates, the landscape developed into a farming area and later a coal mining valley. The last mine closed in 1970 and the area was designated as a forest parkin 1972 because of its great walking potential. The visitor centre offers: café shop picnic areas information about the forest park camping pitches (tents only) The South Wales Miners Museum is located within the visitor centre (there is an entry charge to the museum). The Afan Valley Bike Shed is adjacent to the visitor centre and offers bike hire, a repair and servicing workshop and the sale of bikes and parts. Please note: Sometimes we need to close or divert trails for your safety whilst we undertake maintenance work or forest operations. Occasionally we may have to close a site in extreme weather, such as high winds or snow and ice due to the risk of injury to visitors or staff. Please always follow any instructions onsite and make sure you follow any temporary diversion signs in place. Neath Port Talbot Council manages the car park. There is a charge for parking and a season ticket is available. Directions: Situated on A4107. Follow road from M4, (J40) for 6 miles, passing the village of Cwmafan. Frequent Great Western links London Paddington, Reading, Swindon and Bristol Parkway (connections from north east England and Midlands) with Port Talbot. Arriva Trains Wales direct to Port Talbot from Cardiff, Newport, Hereford, Shrewsbury, Crewe and Manchester, with connections at Cardiff from south and west of England. For overseas visitors, there are good rail/air links from London Gatwick & Heathrow, Bristol and Cardiff International Airports. From Neath & Swansea: First Cymru 159 to Pontrhydyfen; connections to Visitor Centre and Cymmer. Main bus stops at Pontrhydyfen Oakwood, Visitor Centre, Cymmer and Glyncorrwg.